There are bad or badly flawed women in post-1900 literature who annoy (even repel) but also interest us as readers, charm us or the men they encounter (and usually hurt): there are any number in the hardbitten crime novels that inspired the Film Noir femmes fatales, for example. Then there’s Holly Golightly in Breakfast at Tiffany’s (a character I have never managed to find attractive, despite the radiant beauty and cinematic presence of Audrey Hepburn in her portrayal of her). Often treacherous or unfaithful, promiscuous or superficial, in the hands of a gifted writer they can still intrigue us, or else there’s some redeeming feature – a sense of sadness or regret, perhaps, or else the men who love them counterpoint their selfishness with a weary resignation or high-minded tolerance of the suffering they cause – I’m thinking of poor Guy Crouchback’s serially unfaithful wife in the Sword of Honour trilogy, or the similar betrayals by Sylvia of her stoically faithful husband Christopher Tietjens in Ford Madox Brown’s modernist tetralogy Parade’s End (broadcast with partial success and some outstanding performances on Britain’s BBC 2 in 2012). And of course there’s Evelyn Waugh, who in many (especially earlier) novels delighted in portraying scheming vixens (the amoral Brenda Last in A Handful of Dust is an example), offset by male victims usually too stupid, spineless or unimaginative to inspire much sympathy. The socialites and dandies in Brideshead Revisited are drawn with layers of complexity and nuance, and an often ironic witty ambivalence, that enable us to see beneath the characters’ apparent superficiality and place them in a socio-historical context that resonates. I find William Gerhardie’s 1936 novel Of Mortal Love a pale imitation or reflection of Waugh’s satirical acerbity, with a touch of Wildean (or would-be Wildean) epigrammatic humour; its depiction of foppish bohemians and glittering but vacuous debs and artistic types lacks Waugh’s or Wilde’s exuberant edge and mordant wit. Gerhardie is too in love with the very characters who inspire in me a sense of repulsion and distaste. I’m conscious of the fatuity of disliking a novel because one dislikes the central characters, but hope my rather rambling introduction to this post indicates that I’m capable of enjoying a good, well-written novel about nasty characters. This is a bad, often well-written novel about nasty characters. I’ll try to substantiate this claim. The protagonist is a composer called Walter, a penniless Londoner whose initial success in the concert hall has not been consolidated by his subsequent work. Although he’s an indefatigable womaniser, he falls in love with Dinah Fry – a woman who we’re frequently told is the most beautiful in London. The fact that she’s married doesn’t deter either of them from starting an affair. Her justification is that her husband is dull and doesn’t pay her anywhere near enough attention, whereas Walter makes an effort to make her feel wanted. When his attentiveness falls away, because he’s immersed in composing a new opera, she simply goes back to the boring spouse, who has realised he wants the fickle Dinah after all. She also keeps a fop called Eric on hold in case circumstances change. That’s the plot, pretty much. There’s some rather horrible anti-semitism and casual racism – inexcusable even for the historical period (the rise of fascism is noted with chilling insouciance by these amoral egotists). Gerhardie has Dinah gush nonsense and baby-talk with Walter in some hair-curlingly awful scenes (‘kissy-kissy’, ‘drinky-drinky’), and her egocentricity is matched only by her lack of empathy with anyone. Even with Walter she’s really just defining herself through his adulation: ‘concentrate on me’ is her mantra. The opening section of the novel is called Woman is not Meant to Live Alone, which is Dinah’s sole rationale for her promiscuity and infidelity. Dinah was like a plant, who had been starved of sun and rain, and after a shower and a warm day had blossomed out. Walter attributed to his own ministrations the welcome change. He saw before him a young woman who had been starved of love and was now blooming and content. [Dinah meets his mother and this passage continues:] Dinah, when Walter next saw her, never mentioned his mother to him. She was completely uninterested. Walter discovered that though Dinah could be charming to people while she was with them, she contained in herself a supply of attention and concentration for two people only – herself and Walter. she held him by one finger like a dog on a leash. If Walter lagged, she tugged at his finger and – ‘Walky-walky,’ she said, prompting him like a child. As their affair cools, Dinah’s importuning and petulant jealousy of any woman Walter might possibly encounter (‘Be nice to me’ she simpers) unsurprisingly begin to grate even on him. She had had that, too. She had had everything, it seemed, and she would not have you think otherwise. The final section is intended to tug at our heartstrings; instead I couldn’t wait for the novel to end. It was the last unread book I had with me on holiday in Europe this summer; there was nothing else to read, otherwise I’d have abandoned it unfinished. Something different today, as I’m on a train en route for Berlin, and didn’t much care for the last book I read – Patrick Gale’s A Place Called Winter. It’s ok as a light read while travelling, but the plot was a little plodding, I found: a man in early 20C England, well to do, discovers he’s gay, is disgraced and sets off to become a farmer in the dominion of Canada. He ends up at the eponymous pioneer town, guided by a sinister Dane called Troels, whose villainous character becomes ever more that of a pantomime baddie by the end. There’s a touching love affair and a lot of tragic death along the way. So instead I thought I’d pass part of the journey (we passed into Germany from Holland just now – always seems odd that the border is crossed without any official checks) with an account of the journey. From England we took the Eurostar train from St Pancras to Brussels, where we stayed two days, and loved the city. From there on by Thalys train to Amsterdam – the same day that a man was tackled on the corresponding train back from Brussels to Paris by four fellow passengers before he could presumably carry out a massacre. Sobering. After five days in hedonistic, beautiful Amsterdam we settled into the sumptuous café for breakfast at the Centraal station. 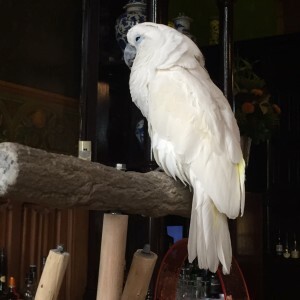 In the former international waiting room there’s a magnificent polished wood bar, ornate wall coverings and stucco – and a white parrot called Elvis. The toilets are equally impressive: the wc pan is made of blue and white delft ware, with a pattern of … parrots. Just as well we had a delicious omelette there: there’s no buffet or restaurant car on this intercity train – a journey of five hours if we stayed on it all the way to Berln. We’ve opted to change at Hanover to pick up the ICE train, about which we’re very excited. Must send pictures to the grandson, who’s very envious. Maybe we’ll be able to get something decent to drink then, even to eat. 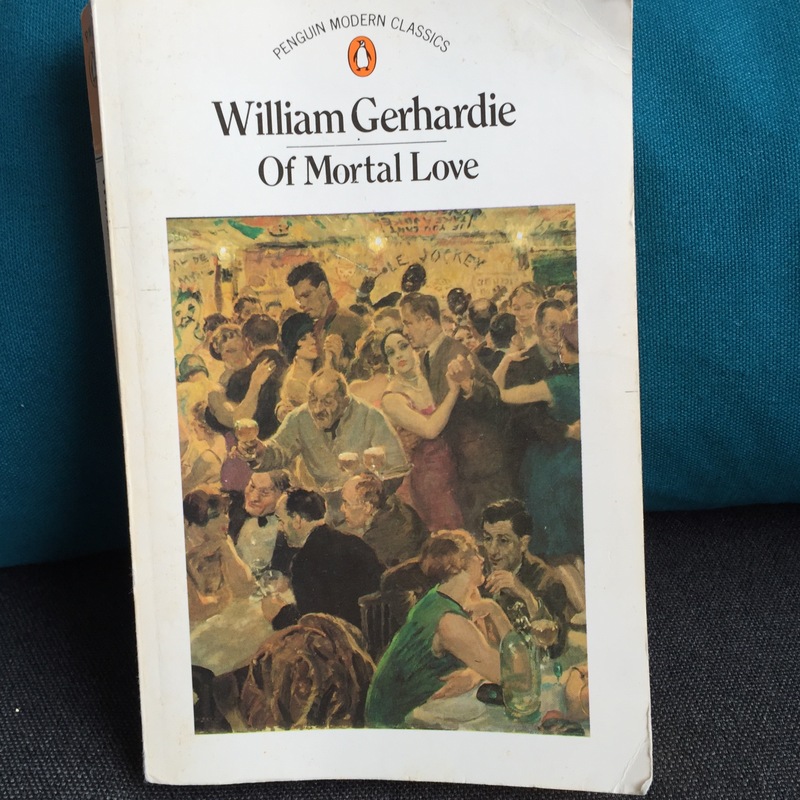 I’ve started reading William Gerhardie’s 1936 novel Of Mortal Love, in an attractive Penguin Modern Classics edition that I’ve owned for ages but never got round to reading. Maybe that will be the subject of my next post. Meanwhile we’re just pulling in to a place called Rheine. The squally weather we left behind in Amsterdam has changed: the sky is blue and the sun is shining. Flat Dutch polders and farmland have been replaced by flat, verdant German pastures. Can’t help imagining the foraging armies that will have marched over the centuries across the parts we’ve been travelling through – especially the blood-soaked fields of Flanders.